Red Hat Enterprise Linux 6 uses SSH Protocol 2 and RSA keys by default (see Section 14.1.3, “Protocol Versions” for more information). Do not generate key pairs as root, as only root would be able to use those keys. Before reinstalling your system, back up the ~/.ssh/ directory to keep the generated key pair. Copy the backed-up data to the home directory in the new system for any user you require, including root. Press Enter to confirm the default location (that is, ~/.ssh/id_rsa) for the newly created key. Copy the content of ~/.ssh/id_rsa.pub into the ~/.ssh/authorized_keys on the machine to which you want to connect, appending it to its end if the file already exists. Press Enter to confirm the default location (that is, ~/.ssh/id_dsa) for the newly created key. Your identification has been saved in /home/john/.ssh/id_dsa. Your public key has been saved in /home/john/.ssh/id_dsa.pub. Copy the content of ~/.ssh/id_dsa.pub into the ~/.ssh/authorized_keys on the machine to which you want to connect, appending it to its end if the file already exists. Press Enter to confirm the default location (that is, ~/.ssh/identity) for the newly created key. Enter a passphrase, and confirm it by entering it again when prompted to do so. For security reasons, avoid using the same password as you use to log into your account. Your identification has been saved in /home/john/.ssh/identity. Your public key has been saved in /home/john/.ssh/identity.pub. Copy the content of ~/.ssh/identity.pub into the ~/.ssh/authorized_keys on the machine to which you want to connect, appending it to its end if the file already exists. See Section 14.2.4.2, “Configuring ssh-agent” for information on how to set up your system to remember the passphrase. Never share your private key with anybody; it is for your personal use only. To store your passphrase so that you do not have to enter it each time you initiate a connection with a remote machine, you can use the ssh-agent authentication agent. 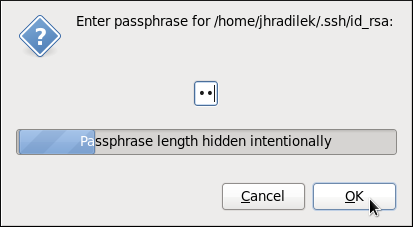 If you are running GNOME, you can configure it to prompt you for your passphrase whenever you log in and remember it during the whole session. Otherwise you can store the passphrase for a certain shell prompt. Make sure you have the openssh-askpass package installed. If not, see Section 8.2.4, “Installing Packages” for more information on how to install new packages in Red Hat Enterprise Linux. 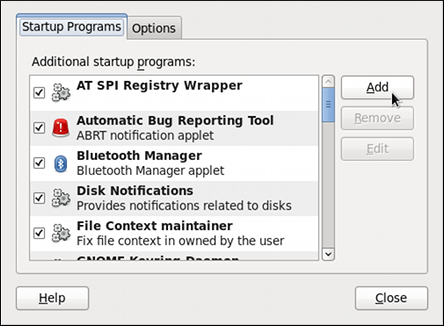 Select System → Preferences → Startup Applications from the panel. The Startup Applications Preferences will be started, and the tab containing a list of available startup programs will be shown by default. Click the Add button on the right, and enter /usr/bin/ssh-add in the Command field. Click Add and make sure the check box next to the newly added item is selected. Log out and then log back in. A dialog box will appear prompting you for your passphrase. From this point on, you should not be prompted for a password by ssh, scp, or sftp. For more information on the available options, see the sshd_config(5) manual page.